Treyarch boss Mark Lamia has dropped a hint that "Zombie Mode," the battle against endless hordes of undead that was so popular in Call of Duty: World at War, may be making a return in Black Ops. 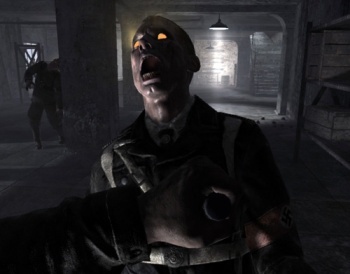 Treyarch's 2008 release Call of Duty: World at War was a dark, gritty FPS portrayal of the Second World War with a not-so-serious twist: Nazi Zombies, a game mode in which players take on endless waves of zombies, either singly or cooperatively, in a desperate battle for survival. It was surprisingly popular, to the point that it was even given a stand-alone translation to the iPhone in late 2009, and Lamia recently hinted to Official PlayStation Magazine that the walking dead might be staging a comeback in Call of Duty: Black Ops. "We really like the Zombie Mode, and as I mentioned I can't talk about the co-op mode other than to say one of the reasons we love it so much is that it feels like it was a fan adopted mode, made out of passion of a lot of the team members here," he said. "All I can tell you is we listen to the fanbase," he added. "Those are our consumers, so..."
But would killing these zombies be so much fun if they're not Nazi zombies? Maybe if we're lucky, Treyarch will make them Nazi zombies anyway, hopefully with an appropriately B-movie-flavored explanation for what they're doing in the game. After all, if you're going to do zombies, you might as well do them right. Call of Duty: Black Ops is scheduled for release on November 9.